10 minute pan fried okra recipe without slime, the BEST fried okra recipe. I have put together some tips on how to pan fried okra easily with NO goo that the vegetable otherwise produces. See my how-to video further down, where I explain my tricks and okra cooking approach. Okra is a misunderstood vegetable. This elongated vegetable has been around for a while and can’t be considered exotic anymore at his point. However, there seems to be still a confusion with the use and proper preparation of the okra. 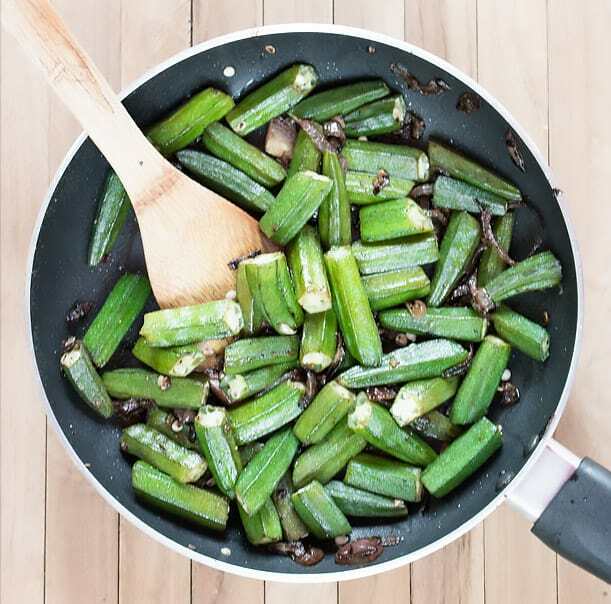 Okra emits a gooey, slimy substance when cut open and this has been the reason why okra has never turned into a household favorite across the world. Yet there is an easy, less known, way to destroy the slime so that you have completely perfectly cooked okra! In a nutshell, okra is an elongated green colored vegetable, which turns about 10 cm (4 inches) long and about 2.5 cm thick (1 inch). 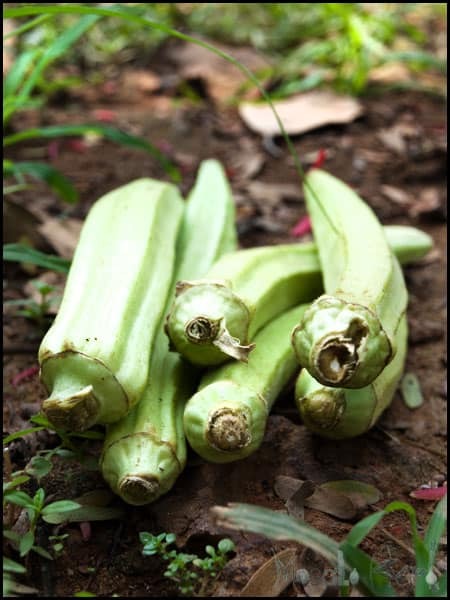 The okra vegetable is firm and has round bright seeds on the inside, between the pentagonal sections. 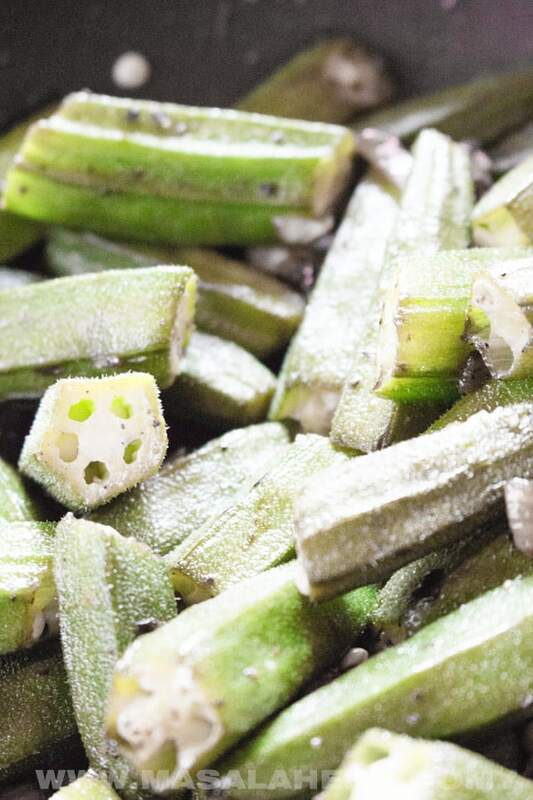 When cut open, okra emits a very slimy transparent substance. The purpose of this post is to show you how to destroy the slimy plant substance to make the BEST pan fried okra! Okra tastes rather plain and I don’t think it has a distinct flavor. I would put it in the category of French beans to compare the flavor. There are different okra varieties in this world! However, you will most probably come across the common long dark green version. I personally enjoy the light green okra, which you can see in the picture. The light green okra variety is more firm and the taste pleasantly intense. Yet you might come across a broader and shorter green okra version, a red version or even a deep purple okra variety. Where is Okra most common? Okra is very popular in the southern parts of the US, Caribbean, Africa, and South Asia. Some places in this world, call okra Ladies’ fingers or gumbo/gambo. In the US gumbo is a common name for okra too. Whereas in the UK and India, people know okra as ladies finger. But in India, the name bhende/bhindi is common as well for okra. You must have come across this vegetable at some point in your local supermarket. It makes an appearance once in a while in Europe, even in remote mountain village supermarkets. Okra is an established vegetable, it just never picked up on popularity because of the slime problem (which I will show you below how to solve!). The vegetable might be seasonal in some parts of the northern hemisphere. Usually, okra is rather commonly available all around the year. You can check out the fresh section of your local Asian store if you can’t find fresh okra in your local supermarket. Low in Calorie. If you are trying to loose weight then okra can be a great addition to your weight loss diet. At the same time okra curbs hunger, you feel full faster and longer. High in Fiber. For a balanced diet to prevent 1st world illnesses such as diabetes, heart disease, and overweight. that special ugly looking slime, which actually has a purpose. The slime includes plant properties which will help your digestion and bowel movement. 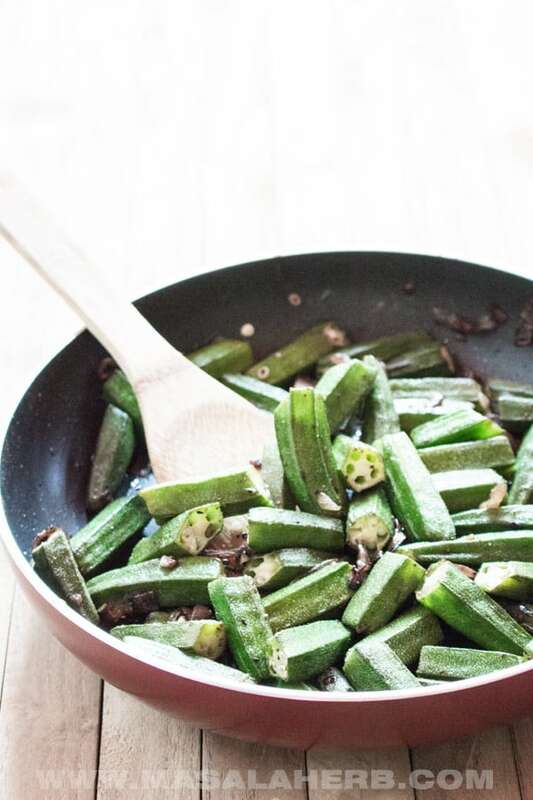 How to cook okra without the slime? Keep the okra pods completely dry before cutting them. The moment you have water touching the insides of a okra, that’s when that irritating goo gets formed. Follow that step and you have pretty fixed the problem to 60%. Stir-fry for a short while on high heat with little oil and no water. The heat helps in breaking down the slime. And to prevent further goo to appear. Add acidity in form of vinegar or lemon juice to the okra. It will kill the remaining slime. For the Acidity: Pick vinegar or lemon, but know that vinegar tends to be a better option because lemon juice turns the okra mushy. The vinegar retains the firmness. In India, they also have another option to turn okra slime-free. There is a plum variety known as Kokum. The skin of a kokum is high in acidity and is added to okra stir-fries as well. Those are my tried and tested tips. If you encountered another lesser-known way to reduce the slime in okra, feel free to share it in a comment further below. How to prepare pan fried Okra? In the video, I explain how to fry okra easily within 10 minutes to cook the best fried plain okra. How to serve the pan fried okra recipe? 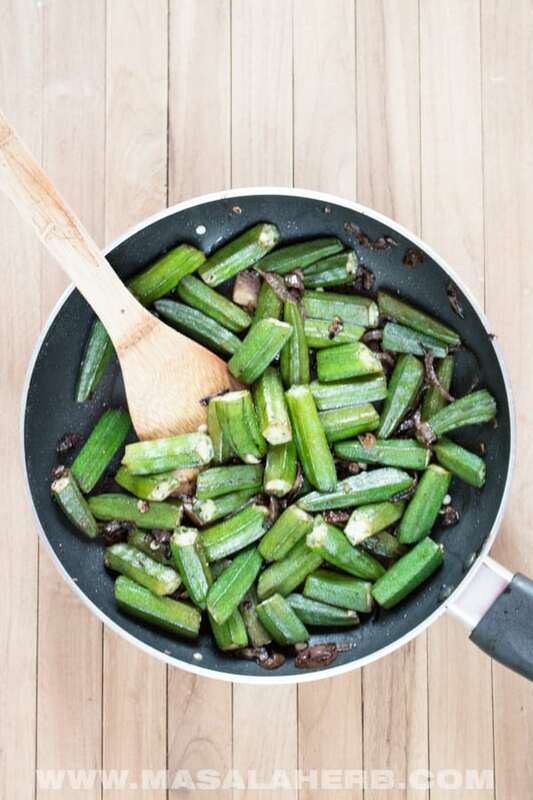 This pan fried okra recipe can be used as a side dish. Use it the way you would use green beans, carrot and potatoes. Serve the okra stir fry meals such as baked chicken, beef steak, lamb shank, stuffed cabbage rolls and potato latkes. The pairing options are endless. This 10 minute pan fried okra recipe is a one pot/pan, vegan and gluten-free side dish. The Vegan fried okra is also prepared without cornmeal and without breading. Therefore it really comes together easily and makes this okra stir fry a skinny healthy and nutritious meal to serve with other dishes. Wash your Okra well to get rid of any impurities. Once you have washed them, dry each okra individually well and keep them on a dry counter space. This step is important as water reacts with the cut open okra and hence forms slime. Then prepare your onion by slicing it and chop your garlic small. Keep aside. To prepare the okra, cut off the ends. Cut the okra into bite-sized pieces or 2 inch long pieces. Keep aside. Grab a frying pan/skillet, add the oil and heat up. Throw in your onion slices and cook soft. Then continue to add the chopped garlic. Season with salt and pepper. Now add in all your okra pieces and let cook for a minute. Then stir fry on high heat for another 2-3 minutes. Pour in the vinegar evenly over the okra. This step is important as it will break down any forming okra slime instantly. Stir-fry for another minute or two on high heat and remove from the heat when ready. The okra is good to be served when it's still firm with a slight crunch on the outside (al dente) but soft cooked inside. Make sure to wash the okra before you cut the pods. When water comes in contact with the seed pod, it forms more slime. Work with dry hands and a dry knife and cutting board. Use acidity to break down remaining slime. You will be surprised how well this works! Use vinegar if possible (apple cider for example), lemon juice can be used too BUT lemon juice turns the okra mushy soft. Be careful to not overcook the okra. Stand next to the pan all the while the vegetable is cooking. Onions can turn black quickly too. Pan fried okra cooks fast. See serving instruction above the recipe card in the post. Dear Reader, have you struggled cooking okra in the past? Please, feel free to share with us your thoughts about the pan fried okra further below in the comment section. I know we’ve gone back and forth on FB regarding my extreme distaste for this vegetable, but your recipe looks very good. I couldn’t find the video though. yep sorry technical problem! Fixing the video asap! 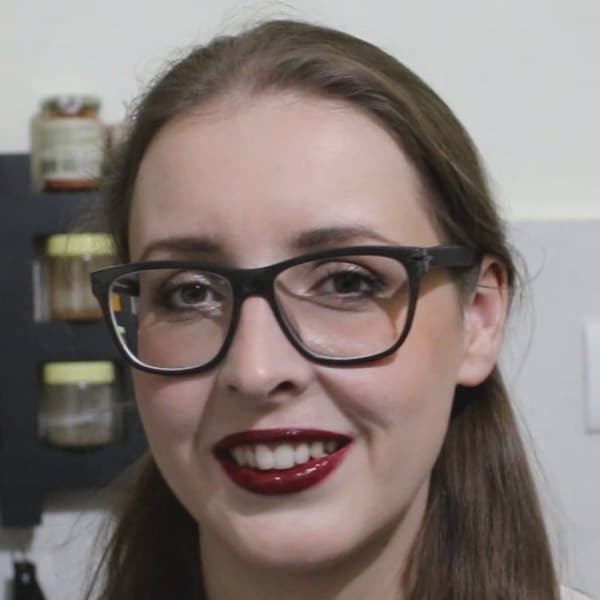 Hi, this may be interesting you: 10 minute Pan Fried Okra Recipe [+Video]!